Selling Telguard's Arlo Go all-wireless cameras is one of the few ways home-technology integrators can earn recurring revenue (RMR) on cellular service without selling back-up cellular for security systems. Clients will want Arlo Go for its long battery life, cellular radio, and host of accessories; integrators will want to sell it because consumers love it and because they get RMR and support from Telguard. The Arlo Go cellular (LTE) camera is a wonderful thing. The mobile camera goes anywhere there’s a cell signal. The video quality and night vision is remarkable. The battery lasts a good long time on its own, but an optional solar panel takes battery life even further. Arlo makes a variety of skins to camouflage the unit. There’s a card slot inside, and various online storage options. It’s super-simple to configure and the user interface is sweet. Read the plentiful online reviews. Users love it for remote areas that (their own) Wi-Fi doesn’t reach – lake houses, construction sites, rental properties, campsites, RVs, raccoon traps, and high up in the trees watching eaglets hatch. It’s a great product, the cellular costs notwithstanding. My product review is below, but my own hands-on experience with a surveillance camera is not the interesting part of this story. The real story is that Telguard, a leading provider of alarm communicators and SHaaS (smart home as a service), sells Arlo Go to security and smart-home dealers. These dealers make recurring monthly revenue (RMR) not just on the interactive smart-home services, but the cellular service itself. Telguard uses AT&T’s LTE service for Arlo Go. Today, there are very few ways for dealers to share in RMR for cellular service. Security dealers make a couple bucks each month on cellular back-up for alarm systems, but the bucks usually stop there. It’s not a toy. It’s something that is very often necessary for security or peace of mind. If you’re not a traditional security dealer, you’re not making anything on cellular services today. With Telguard’s Arlo Go program, however, any qualified installation company – e.g., home technology integrators – can profit from the cameras and the mobile plans. Furthermore, the RMR for each account is more than a couple of bucks. Whereas the retail cost for cellular back-up on alarm systems might be $5 or $10 per month, customers could see cellular bills of $60 and up for Arlo Go service. The relatively high cost of cellular service can be both a benefit and a curse, of course. The RMR might be good for integrators, but the cost to consumers isn’t cheap. This isn’t something you put in the woods and watch live in search of wildlife. It’s not a toy. It’s something that is very often necessary for security or peace of mind. Many users cite mere practicality as their motivation for using Arlo Go. Security dealers and home-technology integrators are uniquely positioned to probe their clients’ lifestyles and recommend this product for a wide range of applications. There are precious few opportunities like it. Transcript of a chat with Verizon, regarding Arlo Go. On the other hand, a Telguard agent answered my phone call in just a couple of rings and knew all the details about the product and service. That is the type of service dealers should expect from Telguard. Consumers can buy Arlo Go from Arlo directly, or from cellular service providers. Why should they instead buy from a home-technology pro? And why should pros buy from Telguard, beyond the shared RMR? For starters, security dealers and A/V integrators have personal relationships with homeowners and already service their home-technology needs. It makes sense for consumers to put all their technology needs in the hands of a single service provider. Likewise, installers themselves maintain personal relationships with Telguard, a service provider that has catered to low-voltage pros for years. Can you imagine a consumer or installer calling AT&T or Verizon directly with questions about their Arlo data plans? I tried it, just for grins. It wasn’t easy (see sidebar, right). On the other hand, I called Telguard for support on the camera, and they DID answer in less than 30 seconds. Although Telguard doesn’t usually take calls from consumers directly, my guy Doug was extremely friendly and knowledgeable, pulling up his own Arlo cameras to test my scenario. When he didn’t know the answer to a tech question, he promised to follow up after the product managers were out of a meeting. He called me 30 minutes later with the answer. Besides the service component, Telguard offers a complete connected experience around its Arlo Go. For starters, it integrates with anything that Arlo does – SmartThings, Alexa, Google Assistant and the others. More interestingly, it works with Telguard’s HomeControl Flex platform, which can be branded as the dealers’ own. 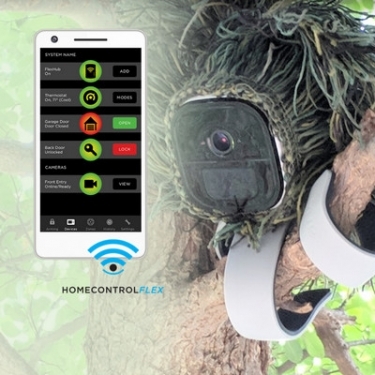 HomeControl Flex comprises both hardware and services, and integrates with IFTTT, the cloud-based if/then engine. The hub includes Z-Wave and Wi-Fi for integration with third-party devices and the cloud. Flex integrates with professional alarm systems and, ultimately, professional monitoring stations via Internet and/or cellular pathways, thanks to Telguard’s cloud service and wide range of alarm communicators. Given that customers need to manage their Arlo usage wisely, it makes great sense to use all the intelligence available to record and transmit video only when necessary. With HomeControl Flex integration, users can trigger Arlo Go to record during certain alarm events, for example, a fire alarm or security breach. Likewise, motion detected through an Arlo Go camera can trigger actions through HomeControl Flex. Activity at the far edge of a property, for example, could signal the lights to turn on at the house. Recorded video from Arlo Go, as well as live viewing, happens within Telguard’s HomeControl Flex app/portal, alongside other security-related functions – no need for app-hopping to access all systems monitored through Telguard. Dealers purchase Telguard+Arlo products from their favorite low-voltage distributor. If they don’t already have a Telguard account, they set one up. Then, just enter the SIM information for the camera, choose a rate plan, “and then they’re done with us,” Welsh explains. Telguard bills the dealer monthly for data usage across all accounts. Dealers in turn bill their customers according to their own rate plans. Plans start at 15 minutes per month, or about 100 MB. This gets the customer about one 30-second clip per day for maybe $10 - $15 per month retail cost. In some cases, this paltry plan will be just fine, for example, when the user simply wants to monitor a building that is supposed to be unoccupied. Telguard offers plans up to 10 hours per month, or about 5,000 MB, for which consumers might pay $70 to $100 per month and get about 20 minutes of video per day. Arlo itself offers its own cellular plan, but it doesn’t go far – maxing out at 225 minutes per month ($33), or about 15 clips per day. When you think about how many minutes per day your video doorbell consumes … 20 minutes is a lot of time. It’s not monitor-the-job-site-all-day amounts of time, but if used strategically the capacity should work for most users. You just have to plan the installation carefully and use the on-board scheduling, motion sensing and (optionally) person-recognition tools strategically. Many customers probably won’t balk at paying $25 to $100 per month to monitor their second home, the outer reaches of their estate, or their yacht. Likewise, in commercial installations, stakeholders probably won’t mind the charge for monitoring their construction sites at night (the camera has excellent night vision). There might be additional costs for the client. Added intelligence like object- and person-recognition, “intelligent notifications” on a smartphone’s lock screen, and e911 emergency call service are available only with an Arlo Smart plan, arranged by the consumer directly with Arlo. The consumer also works directly with Arlo on cloud storage plans. Arlo comes with the free “Smart Basic” plan, which provides a rolling seven days of cloud recording and support for up to five cameras. The “Smart Premier” plan gets users 30 days of cloud recording for up to 10 Arlo cameras, plus the smart features noted above. There’s a MicroSD card slot in the unit, which initially had me thinking you could store multi-gigs’ worth of video locally. Alas, the card can only be used to store the same video that is sent to the cloud. It’s just for back-up, not for additional video capture. The camera positioning tool works well, capturing activity in near-real-time. The night vision is excellent -- this space is pitch dark. Arlo Go, about the size of a baseball, is completely wire-free, no power cable required (although if you have the luxury of a nearby electrical outlet, you can use it). There’s no Wi-Fi. It communicates over cellular via a SIM card, in this case provided by Telguard for AT&T LTE service. It’s IP65-rated for the outdoors. Video is 720p and looks pretty good, and the night-vision setting works well in the pitch dark. There’s an onboard mic and a built-in speaker that isn’t terribly loud. You can carry on two-way conversations with Mom or a burglar, but not at great distances. Also, at the press of a button on the app, you can sound a siren (more like an annoying beeeeeeeeep) through the camera. Installation is a breeze. Download the Arlo app (or head to the website) and simply follow the prompts to get it up and running. Drop in a MicroSD card if you want. There’s a positioning application that shows you in near-real-time what the camera is seeing. Don’t dilly dally in this task because it eats into your valuable minutes. You can also see the view by pressing a hard button on the camera itself, or triggering a snapshot from the app. Users can set arming schedules and the sensitivity of the onboard sensor. It takes time to understand the sensor sensitivity, so dealers would be advised to nail this function in order to optimize battery life and data usage. In busy areas, if the sensitivity is really high, inconsequential movements will trigger the camera to record occasions such as trees moving, possibly devouring a user’s data plan in a day. Arlo Go has a sensor-test mode in which an LED on the front of the device flashes when motion is detected. Users can adjust the sensitivity in real time until it is optimized for the application. The camera has a very wide field of view, so be aware of anything in the peripheral vision that might trip the sensor. It’s a great product. We personally had two great use cases for it, thanks to our multiple moves this year. Users set the amount of time to record when motion is detected, starting at 10 seconds. You can tap into live video with the Arlo Go, but definitely caution customers to use the feature sparingly unless they have a large data plan. Live video is especially handy for two-way conversations. Now if only they made Arlo Go in a doorbell form factor. The product screws into any standard camera mount, but I especially like Arlo’s own Quadpod mount, with sturdy flexible legs that can stand upright or wrap around small structures. It’s a great product. We personally had two great use cases for it, thanks to our multiple moves this year. First, we didn’t occupy our new apartment until six weeks after the lease began, during which time we weren’t paying for Internet. We just plopped the Arlo Go on a counter pointing at the front door. Next, we have an unoccupied home for which we’ve been paying for Internet, largely to monitor one indoor camera and a video doorbell. We don’t need it. Now we have the Arlo Go mounted outside, watching the entryway. It is configured for low sensitivity, so it only trips when a person comes into view. Instead of $50 per month, we’re paying $10. The Arlo solar panel works as promised, but even without it, I can go more than a month without a battery recharge. For consumers, Arlo Go is the ideal option to monitor areas that have no traditional Internet service. For dealers, Telguard is the only place pros can go for dedicated support, integration with professional alarm systems, and RMR on cellular service. Consumers who “get” Arlo Go and its cellular limitations rave about the product. Most of the negative online reviews come from customers who thought they could use the product for live-viewing job sites all day, checking in on the nanny, or monitoring a busy warehouse. Virtually all of the objections would be mitigated with guidance from a pro who understands the benefits and limitations of a mobile camera. I really can’t think of a reason not to add this solution to a dealer’s product portfolio. A little pricey at $430 (street price), but when there’s no other option, you pay the $430.